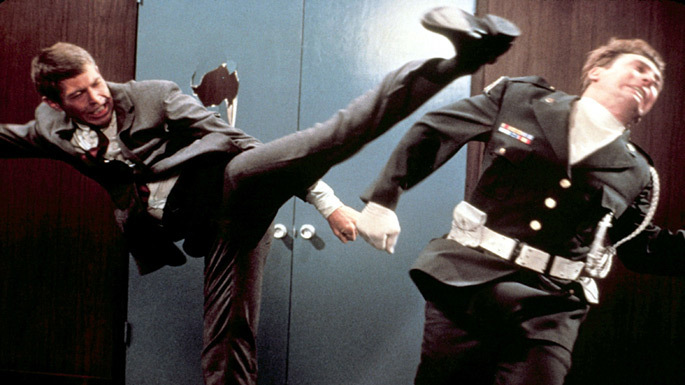 The 101 Action Movies list, currently has me in the swinging 60s, and it didn’t take long back then for American filmmakers to take on the super-spy genre, they’d already done it on television, but nothing could seem to take on the sheer popularity of the UK import of James Bond. That doesn’t mean they weren’t going to try. Our Man Flint is a mostly enjoyable, over-the-top send-up of the gentleman-spy genre, most notably taking shots at the 007 franchise. 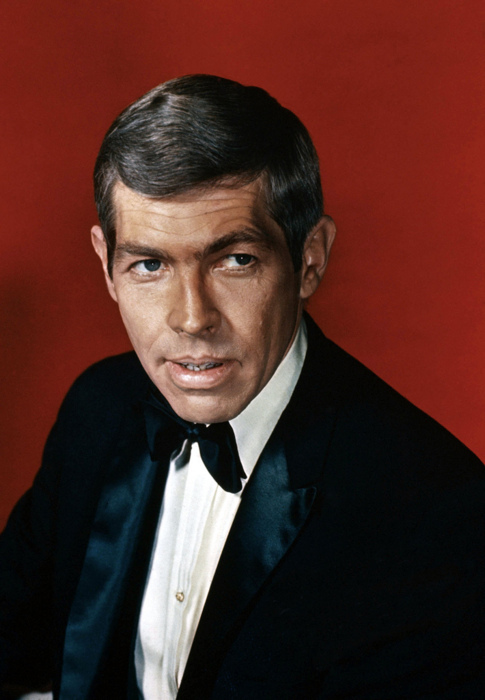 Derek Flint (James Coburn) is a wealthy, retired spy, with the ability to stop his heart for 3+ hours, with four live-in playmates, and he’s a bit of a know-it-all. He is recruited by the Zonal Organization for World Intelligence and Espionage, that’s right Z.O.W.I.E.! His mission is to track down three mad scientists, who operate an organization known as Galaxy, which according to Flint’s briefing from Triple-o 8 is bigger than S.P.E.C.T.R.E. It seems they have a weapon to control the weather, and are going to rework the Earth in their own image. Helping this nefarious organization if the lovely Gila (Gila Golan), who quickly finds herself not immune to Flint’s charms, and Malcom Rodney (Edward Mulhare, who 80s kids will remember as Devon from Knight Rider). Nothing is going to stop Flint on his mission after his playmates are nabbed by Galaxy. His recruiter and former boss, Cramden (Lee J. Cobb) offers to outfit him with any gadgets he may need with a familiar looking briefcase. Turning it down, he instead relies on his multi-purpose (80-odd gadgets) lighter. The film doesn’t take it’s seriously at all, and Coburn seems to have a grand time, with countless women fawning over him, as he strolls around the film, dealing judo chops, and acting suave. My biggest fault with the film lays in the set design, as almost everything is filmed on them, and they are rather obvious. The sets of the Bond films have always been fantastic, as have the production values, making it epic and larger than life. This film, everything seems smaller, a bargain basement knock-off because the production value isn’t there. Despite that, the film spawned a sequel, In Like Flint, a year later. The thing I most enjoyed about the film, was the fact that one of the Galaxy thugs, played by Michael St.Clair was named Hans Gruber… I wonder if he was related to the fellow at Nakatomi Plaza? A film like this shows you what an amazingly fine line the early Bond films walked, balancing the action, gadgets and sense of fun without descending into downright parody and spoofing themselves. Instead they left it to films like this, to do that for them. Coburn’s know-it-all Flint is a bit of a hoot, and I love the fact that he seems to be knowledgeable about everything. When Cramden is attacked with a poison dart, Flint operates on him right then and there in the restaurant, and then apologizes for the shoddy cut he’s made to remove the poison. A rather silly, but none the less entertaining entry on the list. Did you see it? 0008007101 action moviescramdendaniel mannderek flintdevonedward mulharegalaxygilagila golanhans gruberjames bondjames coburnknight riderlee j. cobblightermalcolm rodneymichael st. clairour man fllints.p.e.c.t.r.e.swinging 60sz.o.w.i.e.